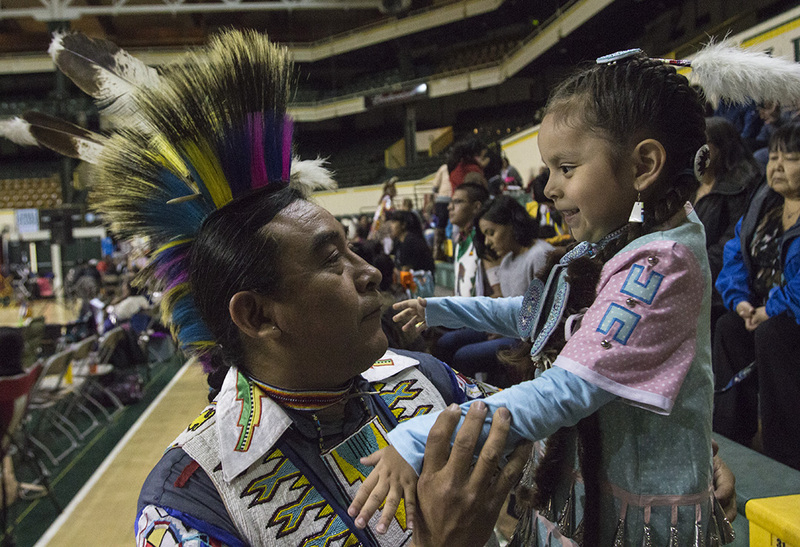 The University of Oregon held its 49th Annual UO Mother’s Day Powwow. Here is the Littlesinger family in five photographs on opening night of the event. Michelle Littlesinger, from the Yakama tribe, holds her 7-week-old son, Ezrah, in the crowd on the first day of the 49th Annual UO Mother’s Day Powwow. Littlesinger considers herself on maternity leave from dancing, but has been helping out by braiding hair. Myrcene Littlesinger, 4, kisses her brother Ezrah’s cheek. Myrcene glances back with a smile at her parents before she begins her jingle dress dance. During her jingle dress dance, Myrcene looked toward her parents in the bleachers. Her mother, Michelle, says that this dance sounds like rain on a tin roof. The cones on the jingle dress are often made from Copenhagen tobacco lids, pierced, shaped and sewn onto the dress.